Inducted into the Black Filmmakers Hall of Fame in 1992, Madeline Anderson is a trail-blazer in many ways—including being the first American-born black woman, in a film industry union, to produce a documentary film. Newly preserved and available on home video for the first time, Madeline Anderson’s Integration Report 1 (1960), A Tribute to Malcolm X (1967), and the classic I Am Somebody (1970) bring viewers to the front lines of the fight for civil rights. A testament to the courage of the workers and activists at the heart of her films as well as her own bravery, tenacity and skill, the films of Madeline Anderson are both essential historical records of activism and a vital body of cinematic work. In 1969, black female hospital workers in Charleston, South Carolina went on strike for union recognition and a wage increase, only to find themselves in a confrontation with the state government and the National Guard. 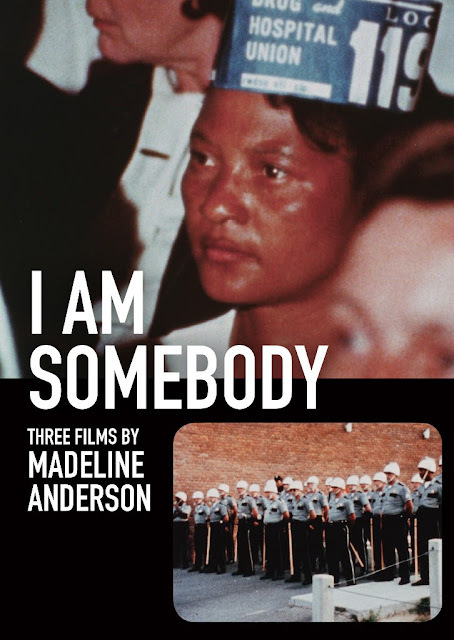 Featuring Andrew Young, Charles Abernathy, and Coretta Scott King and produced by Local 1199, New York’s Drug and Hospital Union, I Am Somebody is a crucial document in the struggle for labor rights. Examines the struggle for black equality in Montgomery, Alabama, Brooklyn, New York, and Washington, D.C. Includes footage by documentary legends Albert Maysles and Ricky Leacock, protest songs sung by Maya Angelou, and a speech by Martin Luther King, Jr. Bonus features include: UHD digital scan of I Am Somebody and photochemical preservation of Integration Report 1 with the support of the Smithsonian's National Museum of African American History and Culture; a Smithsonian oral history video interview; a 28-page booklet including an interview between Rhea L. Combs, PhD, and Madeline Anderson; and Celebrate Moe!, a 13-minute featurette on Moe Foner, the union leader who commissioned I Am Somebody, by Michelle Miller.